In geology, the places known as hotspots or hot spots are volcanic regions thought to be fed by underlying mantle that is anomalously hot compared with the surrounding mantle. [ citation needed ] Their position on the Earth's surface is independent of tectonic plate boundaries. There are two hypotheses that attempt to explain their origins. One suggests that hotspots are due to mantle plumes that rise as thermal diapirs from the core–mantle boundary. The other hypothesis is that lithospheric extension permits the passive rising of melt from shallow depths. This hypothesis considers the term "hotspot" to be a misnomer, asserting that the mantle source beneath them is, in fact, not anomalously hot at all. 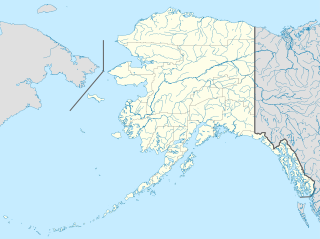 Well-known examples include the Hawaii, Iceland and Yellowstone hotspots. 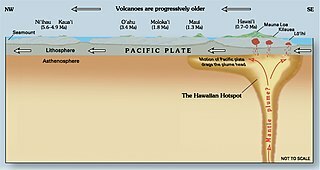 The origins of the concept of hotspots lie in the work of J. Tuzo Wilson, who postulated in 1963 that the formation of the Hawaiian Islands resulted from the slow movement of a tectonic plate across a hot region beneath the surface. It was later postulated that hotspots are fed by narrow streams of hot mantle rising from the Earth's core–mantle boundary in a structure called a mantle plume. Whether or not such mantle plumes exist is the subject of a major controversy in Earth science. Estimates for the number of hotspots postulated to be fed by mantle plumes have ranged from about 20 to several thousands, over the years, with most geologists considering a few tens to exist. 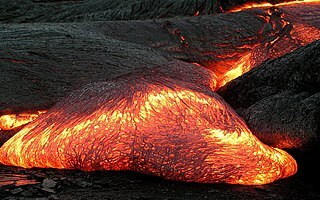 Hawaii, Réunion, Yellowstone, Galápagos, and Iceland are some of the most active volcanic regions to which the hypothesis is applied. In thermodynamics, heat is energy in transfer to or from a thermodynamic system, by mechanisms other than thermodynamic work or transfer of matter. The mechanisms include conduction, through direct contact of immobile bodies, or through a wall or barrier that is impermeable to matter; or radiation between separated bodies; or isochoric mechanical work done by the surroundings on the system of interest; or Joule heating by an electric current driven through the system of interest by an external system; or a combination of these. When there is a suitable path between two systems with different temperatures, heat transfer occurs necessarily, immediately, and spontaneously from the hotter to the colder system. Thermal conduction occurs by the stochastic (random) motion of microscopic particles. In contrast, thermodynamic work is defined by mechanisms that act macroscopically and directly on the system's whole-body state variables; for example, change of the system's volume through a piston's motion with externally measurable force; or change of the system's internal electric polarization through an externally measurable change in electric field. The definition of heat transfer does not require that the process be in any sense smooth. For example, a bolt of lightning may transfer heat to a body. Continental crust is the layer of igneous, sedimentary, and metamorphic rocks that forms the continents and the areas of shallow seabed close to their shores, known as continental shelves. This layer is sometimes called sial because its bulk composition is richer in silicates and aluminium minerals and has a lower density compared to the oceanic crust, called sima which is richer in magnesium silicate minerals and is denser. 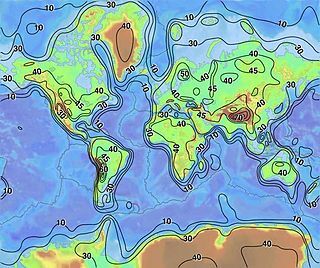 Changes in seismic wave velocities have shown that at a certain depth, there is a reasonably sharp contrast between the more felsic upper continental crust and the lower continental crust, which is more mafic in character. The Iceland hotspot is a hotspot which is partly responsible for the high volcanic activity which has formed the Iceland Plateau and the island of Iceland. The Cobb Hotspot is a marine volcanic hotspot located at, which is 460 km (290 mi) west of Oregon and Washington, North America, in the Pacific Ocean. Over geologic time, the Earth's surface has migrated with respect to the hotspot through plate tectonics, creating the Cobb-Eicklberg seamount chain. The hotspot is currently collocated with the Juan de Fuca Ridge. 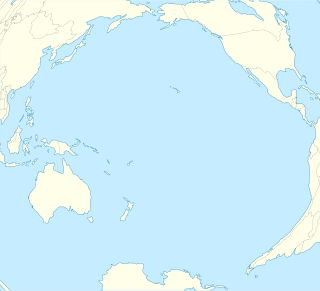 The Southwest Indian Ridge (SWIR) is a mid-ocean ridge located along the floors of the south-west Indian Ocean and south-east Atlantic Ocean. A divergent tectonic plate boundary separating the African Plate to the north from the Antarctic Plate to the south, the SWIR is characterised by ultra-slow spreading rates combined with a fast lengthening of its axis between the two flanking triple junctions, Rodrigues in the Indian Ocean and Bouvet in the Atlantic Ocean. The Southeast Indian Ridge (SEIR) is a mid-ocean ridge in the southern Indian Ocean. A divergent tectonic plate boundary stretching almost 6,000 km (3,700 mi) between the Rodrigues Triple Junction in the Indian Ocean and the Macquarie Triple Junction in the Pacific Ocean, the SEIR forms the plate boundary between the Australian and Antarctic plates since the Oligocene (anomaly 13). 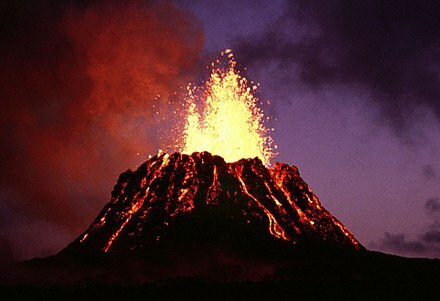 The Louisville hotspot is a volcanic hotspot responsible for the volcanic activity that has formed the Louisville Ridge in the southern Pacific Ocean. The Shona or Meteor hotspot is a volcanic hotspot located in the southern Atlantic Ocean. Its zig-zag-shaped hotspot track, a chain of seamounts and ridges, stretches from its current location at or near the southern end of the Mid-Atlantic Ridge to South Africa. 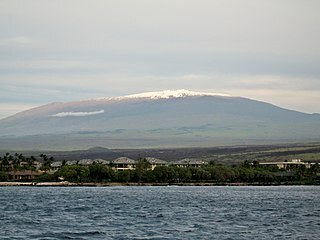 Musicians Seamounts are a chain of seamounts in the Pacific Ocean, north of the Hawaiian Ridge. There are about 65 seamounts, some of which are named after musicians. These seamounts exist in two chains, one of which has been attributed to a probably now-extinct hotspot called the Euterpe hotspot. Others may have formed in response to plate tectonics associated with the boundary between the Pacific Plate and the former Farallon Plate. 1 2 W. J. Morgan (5 March 1971). "Convection Plumes in the Lower Mantle". Nature. 230 (5288): 42–43. Bibcode:1971Natur.230...42M. doi:10.1038/230042a0. ↑ "Do plumes exist?" . Retrieved 2010-04-25. 1 2 3 Foulger, G.R. (2010). Plates vs. Plumes: A Geological Controversy. Wiley-Blackwell. ISBN 978-1-4051-6148-0. ↑ Wilson, J. Tuzo (1963). 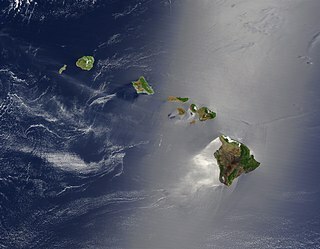 "A possible origin of the Hawaiian Islands" (PDF). Canadian Journal of Physics. 41 (6): 863–870. Bibcode:1963CaJPh..41..863W. doi:10.1139/p63-094. ↑ Wright, Laura (November 2000). "Earth's interior: Raising hot spots". Geotimes. American Geological Institute . Retrieved 2008-06-15. ↑ Donald Hyndman; David Hyndman (1 January 2016). Natural Hazards and Disasters. Cengage Learning. pp. 44–. ISBN 978-1-305-88818-0. ↑ Wolfgang Frisch; Martin Meschede; Ronald C. Blakey (2 November 2010). Plate Tectonics: Continental Drift and Mountain Building. Springer Science & Business Media. pp. 87–. ISBN 978-3-540-76504-2. ↑ Holbek, Peter (November 1983). "Report on Preliminary Geology and Geochemistry of the Ilga Claim Group" (PDF). Retrieved 2008-06-15. ↑ Mainak Choudhuri; Michal Nemčok (22 August 2016). Mantle Plumes and Their Effects. Springer. pp. 18–. ISBN 978-3-319-44239-6. ↑ "Axial Seamount". PMEL Earth-Ocean Interactions Program. NOAA . Retrieved 23 September 2014. ↑ "What the hell is Hawaii?" . Retrieved 2011-01-07. ↑ Courtillot, V.; Davaillie, A.; Besse, J.; Stock, J. (2003). "Three distinct types of hotspots in the Earth's mantle". Earth Planet. Sci. Lett. 205 (3–4): 295–308. Bibcode:2003E&PSL.205..295C. CiteSeerX 10.1.1.693.6042 . doi:10.1016/S0012-821X(02)01048-8. ↑ E. V. Verzhbitsky (2003). "Geothermal regime and genesis of the Ninety-East and Chagos-Laccadive ridges". Journal of Geodynamics. 35 (3): 289. Bibcode:2003JGeo...35..289V. doi:10.1016/S0264-3707(02)00068-6. 1 2 3 4 5 6 7 8 9 10 11 12 13 14 15 16 17 18 19 20 21 22 23 24 25 26 27 28 29 30 31 32 33 34 35 36 37 38 39 40 41 42 43 44 45 46 47 48 49 50 51 52 53 54 55 56 57 58 59 60 61 W. J. Morgan and J. P. Morgan. "Plate velocities in hotspot reference frame: electronic supplement" (PDF). Retrieved 2011-11-06. ↑ Nielsen, Søren B.; Stephenson, Randell; Thomsen, Erik (13 December 2007). "Letter:Dynamics of Mid-Palaeocene North Atlantic rifting linked with European intra-plate deformations". Nature. 450 (7172): 1071–1074. Bibcode:2007Natur.450.1071N. doi:10.1038/nature06379. PMID 18075591. ↑ O'Neill, C.; Müller, R. D.; Steinberger, B. (2003). 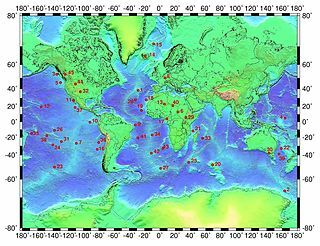 "Revised Indian plate rotations based on the motion of Indian Ocean hotspots" (PDF). Earth and Planetary Science Letters. 215 (1–2): 151–168. Bibcode:2003E&PSL.215..151O. CiteSeerX 10.1.1.716.4910 . doi:10.1016/S0012-821X(03)00368-6. Archived from the original (PDF) on 26 July 2011. ↑ O'Connor, J. M.; le Roex, A. P. (1992). "South Atlantic hot spot-plume systems. 1: Distribution of volcanism in time and space". Earth and Planetary Science Letters. 113 (3): 343–364. Bibcode:1992E&PSL.113..343O. doi:10.1016/0012-821X(92)90138-L.
↑ Smith, Robert B.; Jordan, Michael; Steinberger, Bernhard; Puskas, Christine M.; Farrell, Jamie; Waite, Gregory P.; Husen, Stephan; Chang, Wu-Lung; O'Connell, Richard (20 November 2009). "Geodynamics of the Yellowstone hotspot and mantle plume: Seismic and GPS imaging, kinematics and mantle flow" (PDF). Journal of Volcanology and Geothermal Research. 188 (1–3): 26–56. Bibcode:2009JVGR..188...26S. doi:10.1016/j.jvolgeores.2009.08.020. ↑ "Catalogue of Canadian volcanoes- Anahim volcanic belt". Natural Resources Canada. Geological Survey of Canada. Archived from the original on 2011-07-16. Retrieved 2008-06-14. Wikimedia Commons has media related to Hotspot volcanoes .